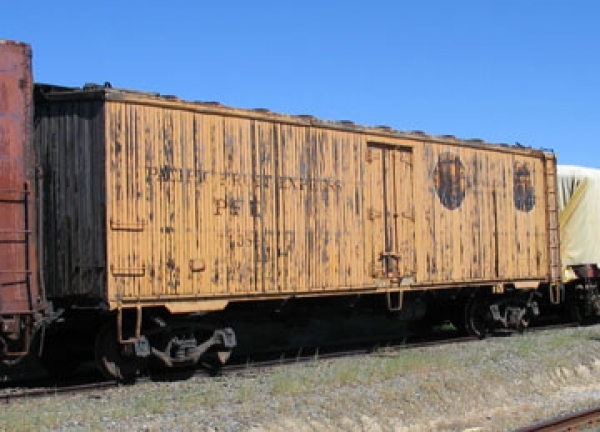 Pacific Fruit Express 74583 is a 30-ton wooden ventilated refrigerator car. It was built as PFE 20420, in class R-30-12, in 1922 by the Standard Steel Car Co. It was in built into the series 19920 to 22519 (2600 cars). The car was rebuilt in to class R-30-16 and renumbered to 74583 in 1941. Owners: Pacific Fruit Express 74583. Pacific Fruit Express 20420. Technical Data: Type, Refrigerator car, wood. Builder and date, Standard Steel Car Co in 1922. Class, R-30-12 when build, R-30-16 when rebuilt in 1941. Underframe, steel. Ends, wood. Roof, metal. Lightweight, 52,488 pounds. Capacity, 60,000 pounds. Trucks: Truck center. Trucks. Wheels. Wheelbase. Journals. Air Brake Equipment: Air brake system, AB. Brake cylinder. Hand brake, Horizontal brake wheel. Dimensions: Length, 44’ 3 1/4”over pulling faces, 40’ 9 7/8” over end sills. Width. Height. Doors, side doors double hinged outward, roof hatches. Misc Data: Coupler. Draft gear. The insulation in the walls is 1 1/2” Flexinum, roof is 2” Hairfelt, and the floor is 2” of cork. Current Condition: Car is complete and in good condition. It needs painting. Proposed Future Treatment: Car should be restored to its 1922 appearance as part of the “Great Yellow Fleet”.